In my "real job" I am a business professor but in the summer I transform into a house painter and designer. Several months ago I bought three student rentals. 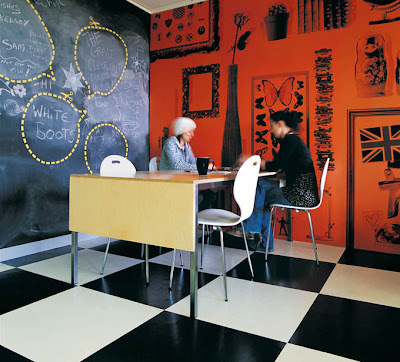 This morning I was looking at thecoolhunter.net site and I was inspired by this picture to paint some of the walls with chalkboard paint. This actually makes a lot of sense, because it seems that there are a lot of students who like to write on the walls whether there is a chalkboard on it or not!